Perry has long been known for its charming little downtown, stately structures and Southern hospitality. Join us on a ramble through history. In 1822 twenty families were living in log cabins calling their little settlement Wattsville. They made paths and roads that crossed at right angles through thickets of tall pines, waving saplings and rich undergrowth or red oak to connect with each other and lead back to civilization. Land this rich and well places soon drew more settlers. Purchasers came not only from surrounding counties but from neighboring Florida, North Carolina and South Carolina. By 1824 Justices of the Inferior Court had sold most of the lots in this new settlement, and residences and businesses were beginning to change the village of Wattsville into the renamed town of Perry. No one is certain who selected the new name, but most claim that it was names for Commodore Perry, a hero of the Battle of Lake Erie. The corporate limits of the town extended one-half mile in each direction from the center of the public square, except where Big Indian creek formed a natural boundary. Families began moving to Perry and political leaders, began to emerge. James M. Kelly, first reporter for the Georgia Supreme Court, and Edwin Mounger, Georgia State Treasurer, both owned lots in Perry. Perry's history became very rich in political leadership, lore and tradition. Its location at the crossroads of major highways running from the northern states into sunny Florida made Perry a stop in route for many travelers. 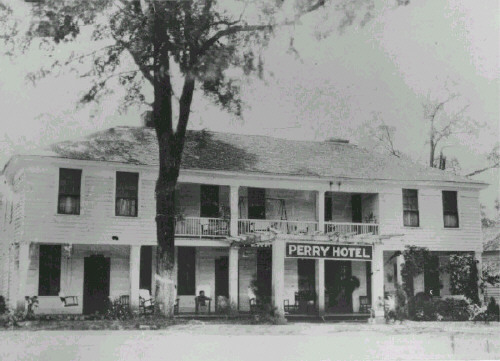 The New Perry Hotel was built in 1925 on the site of the original Perry Hotel, a large two story hotel erected in 1870 to accommodate the stage coach line and the extension of the railroad into Perry. 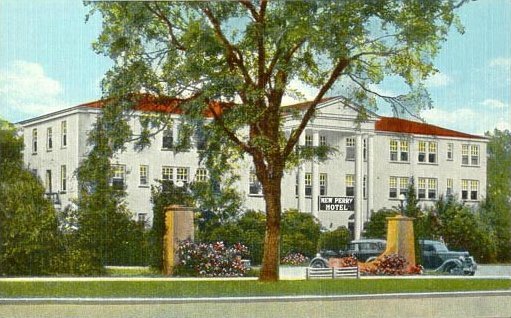 The New Perry Hotel became a popular tourist accommodation in the 1920’s, when U.S. Highway 41 was paved from Tennessee to Florida. 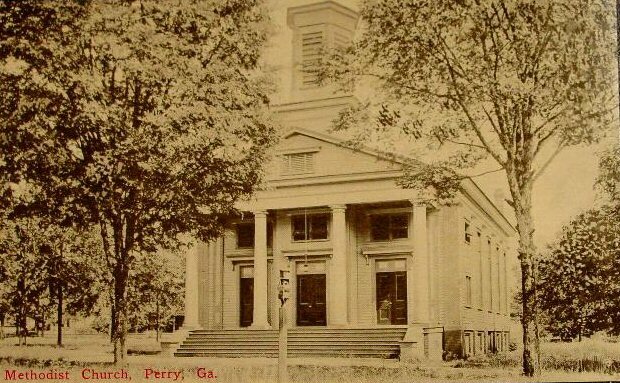 The Perry Methodist Church was organized in 1826. The building about dates from 1860 though it has gone through various alterations. Additional photos can be found in our online Photo Album.